This time of of year seems like a good occasion to review your open questions and close them. Please see this blog if anyone needs more information on how / why to do this. Besides a goat, I mean. Good idea. See something you like - "like" (or upvote) it! Yeah, did so and found 3 to *accept*. (I don't like the term 'close' for this, as there also is a "close" function here (hidden behinde 'Actions', see screenshot), but that is not what we want - we want to *accpet* an answer, so there is a 'best answer' to the question an the question the is listed/marked as 'answered' ). Closing a question indicates that you do not expect additional input from members, it is still useful (although you cannot filter out these on our site). Of course, only question authors and moderators can see this option. I do see the *accept* link in my questions just fine. My point (or: critique), was that there are 2 ways to "settle" a question: 'close it' and/or 'accept an answer to it' . I only *accept* to have the question marked as "answered". And I think we wouldn’t lose a lot if we got rid of the "close"-function altogether or made in mod-only! I just had such a case where 'closing' with "answer no longer expected' would have fitted. (Problem seems to have been solved by itself). Still I chose to give myself a dummy answer, in order to have something to *accept* (and get that nice checkmark on the question). Das anyone see any drawback in doing so? There is a closing reason: Problem is not reproducible or outdated, which I would use in your case. To me it makes sense to have in lists the option to filter out closed questions when you search for unanswered ones (e.g. as check-box) and an indicator in the profile to see that the question is closed. A dummy answer set as best does not add much value. 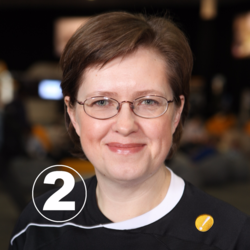 Take a look at how Jelena Perfiljeva closed an old question (Process / document flow for an odd scenario in sales + manufacturing) - she used a closing reason and a short explanation in a comment explaining why the question is not relevant anymore. In that particular case either way ("dummy" answer or close as no longer relevant) is acceptable IMHO. Considering that currently closed questions are not filtered out as answered the "dummy" answer option would be preferable, if possible. But ideally both should work. In this case I used the term "close" loosely, more as in "getting closure" than referring specifically to the closing action on SCN. Unfortunately, it's hard to define the action exactly in this case. You are "accepting" an answer but what are you doing to the question? "Please accept your questions" sounds odd and is also incorrect. "Please identify the best answer for your question and accept it or close the question if you no longer expect it to be answered" is way too long. On Twitter I just said "do the needful". :) As much as I hate that phrase, in this case it seems perfectly appropriate. You mean, as loosely as using "reply" in these days of comments and answers? It's probably been discussed before (and probably loads of times), but why is it that it's possible to close a question with the "answer accepted" reason, when no answer has been accepted? To my mind it’s an over complicated logic design. This question did come up before, shortly after go-live. In addition to what Steffi said (no validation), it seems that the "reasons for closure" just came with AnswerHub platform and no one really bothered to adjust them. The verbiage of some other reasons doesn't make much sense either. E.g. why would anyone declare their own question as "off topic" or "too subjective"? This looks like something the moderators would use on some chit-chat forum.